January 30, 2019 – Start making plans, Lionsbridge FC fans! The league portion of 2019 schedule is set. USL League Two, the top amateur men’s soccer league in North America, announced the league-wide 2019 schedule on Wednesday. 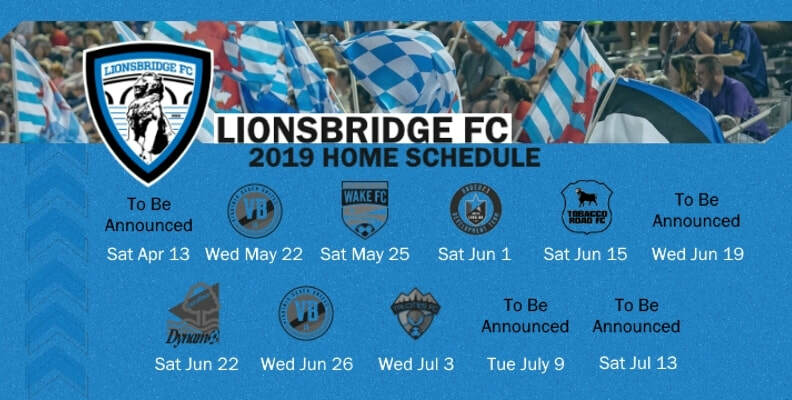 Lionsbridge FC will open the regular season on the road before returning to Pomoco Stadium for the home opener on Wednesday, May 22 vs. Virginia Beach United, the first of three matches against the new Hampton Roads rival. ​Additional home dates against league opponents are set for May 25 (Wake FC), June 1 (North Carolina FC U23), June 15 (Tobacco Road FC), June 22 (Carolina Dynamo), June 26 (Virginia Beach United), July 3 (Tri-Cities FC). Lionsbridge FC will announce four additional matches against non-league opponents in the coming weeks. Those games will take place on April 13 (preseason friendly), June 19, July 9 and July 13. Three teams in the South Atlantic are new to the division, and two of the three are expansion sides: Wake FC and Virginia Beach United. Tri-Cities competed in the Deep South division in 2018.